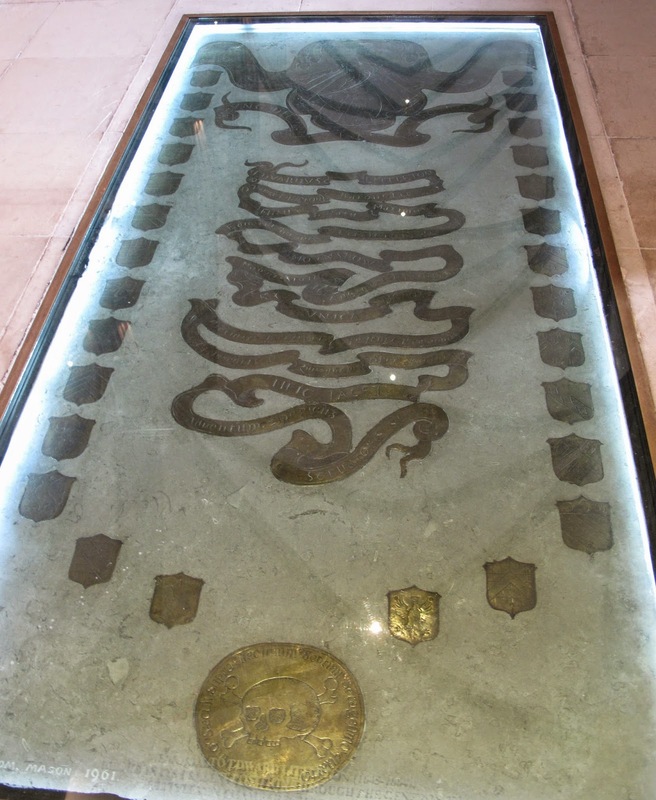 There is in the floor of the Temple Church in London, under glass (or plexiglass; either way, it's thick enough to walk on, though I didn't) and lit from the sides, a monument to several members of the Littleton family: Edward, Thomas, and another Edward. I found it to be a wonderful heraldic display, but not everyone seems to share my enthusiasm for it. Simon Bradley and Nikolaus Pevsner in their book London: The City Churches describe it as a “Brass of Edward Littleton, 1664, with a vainglorious display of arms.” Hence the title of this post. The monument contains a total of 29 separate coats of arms, so I will probably break them down over several posts, instead of trying to do all of them in a single (overwhelming) one. 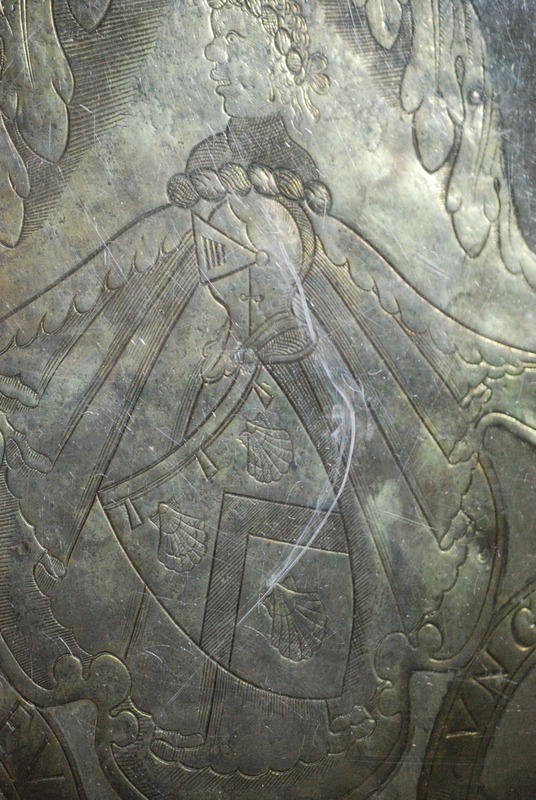 As you can see from the overall picture of the monument, there is a representation of the Littleton arms at the top, with a long and flowing scroll beneath it, and accompanied by 28 small brass coats of arms down each side and into the bottom. The arms are blazoned Argent a chevron between three escallops sable, a label for difference. Lyttelton (Baron Lyttelton; Sir Thomas Lyttleton, Knt., of Frankley, Judge of Common Pleas, author of "The Treatise on Tenures," d. 1481, leaving three sons: I. Sir William Lyttleton, Knt., of Frankley, ancestor of the Lords Lylletton; II. 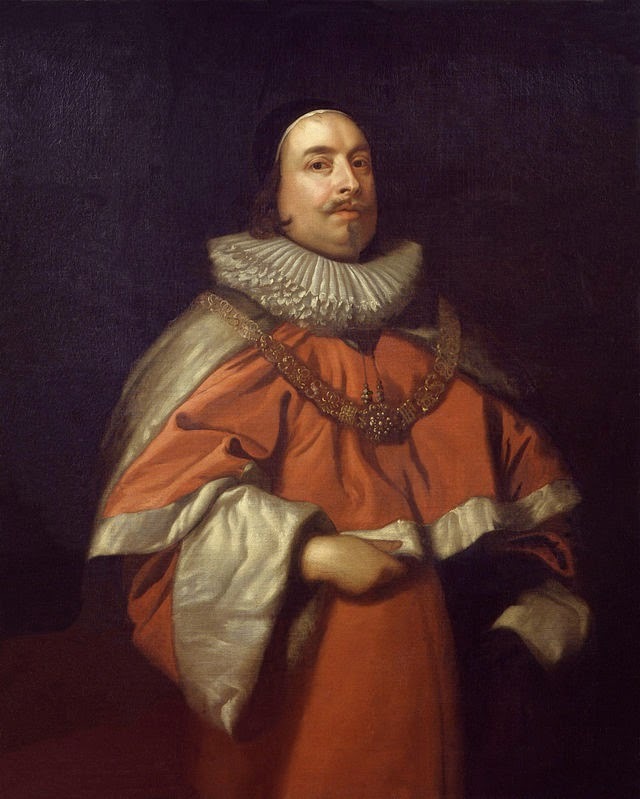 Richard Lyttleton, ancestor of Littleton. Bart., of Pillaton, extinct, and of Lord Hatherton; III, Thomas Littleton, Esq., of Spetchley, ancestor of Littleton, Bart., of Stoke Milburgh, extinct, and Lord Lyttleton, of Mounslow, extinct). 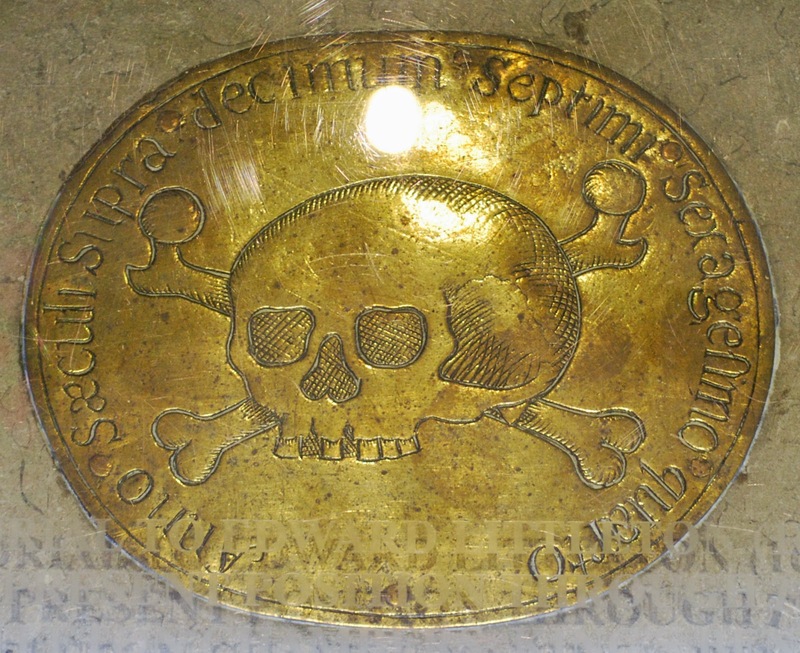 Argent[gent] a chev[ron] betw[een] three escallops Sable[ble]. This family also bears the following quarterings: 1st, ar[gent] a bend cotised sa[ble] a bordure engr[ailed] gu[les] bezanty, for Westcote ; 2nd, gu[les] a lion ramp[ant] and a bordure engr[ailed] or, for Talbot; 3rd, ar[gent] six fleurs-de-lis, three, two, and one, and a chief indented or, for Paston; 4th, France and England quarterly, within a bordure gobony ar[gent] and az[ure], for Beaufort. Crest—A Moor's head in profile couped at the shoulders p[ro]p[e]r. wreathed about the temples ar[gent] and sa[ble]. Supporters—On either side a merman p[ro]p[e]r. in the exterior hand of each a trident or. Motto—Ung Dieu, ung roy. The following illustrations are a portrait of Baron Littleton by Van Dyke and an engraving of Sir Thomas Littleton. Just so you know some of the players here. There is a fair bit of biographical information about various members of the Littleton family on Wikipedia and in the Dictionary of National Biography, so I’m not going to repeat all of that here. Suffice it to say that the family was a prominent one, including barons, baronets, knights, statesmen, and a keeper of the Great Seal of England. Next time, we’ll start looking at the 14 shields in the Littleton lineage from Sir Adam Littleton, followed by the 14 shields in the lineage of Ethelreda (Poyntz) Littleton, Sir Adam’s wife.